Every year NB club members and other birders join to together to count the birds in a clearly defined area in and around Barrie. The area is divided into sections and each section is looked after by a leader who assigns the counters to teams and each team is given a specific area within the section. Then the fun begins. Starting around 8:00 a.m., the count generally lasts until about 2 to 3 p.m. with a break for lunch. Team leaders determine meeting places and start times and team composition. Participants must register no later than Dec. 8th, with Chris Evans who will distribute people (Both beginners and experts) among 9 groups, each with a leader. 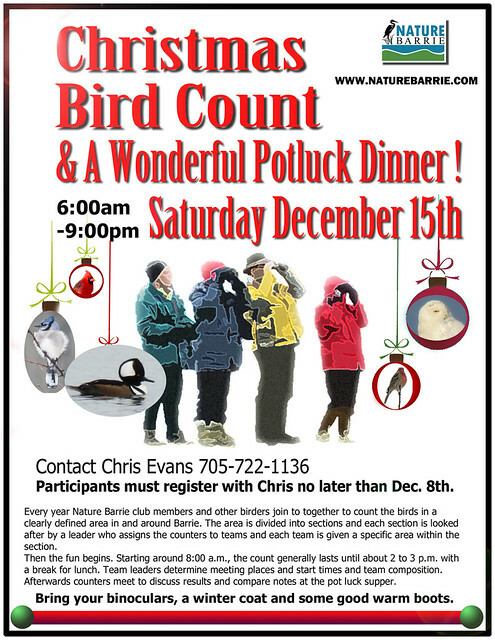 The Orillia and Midland-Penetang Christmas Bird Counts are also held on the same day. The Collingwood Christmas Bird Count will be held on December 27th and the Carden Alvar Christmas Bird Count will be the last held on Thursday, January 3, 2019.